Solid wood flooring is milled from a single piece of timber that is kiln or air dried before sawing. Depending on the desired look of the floor, the timber can be cut in three ways: flat-sawn, quarter-sawn, and rift-sawn. The timber is cut to the desired dimensions and either packed unfinished for a site-finished installation or finished at the factory. The moisture content at time of manufacturing is carefully controlled to ensure the product does not warp during transport and storage. 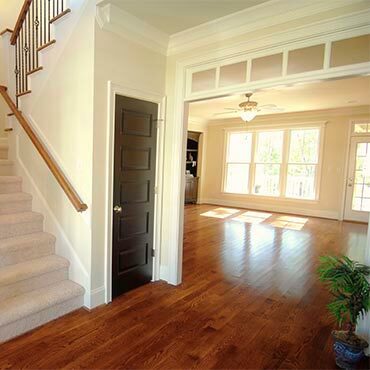 A number of proprietary features for solid wood floors are available. Many solid woods come with grooves cut into the back of the wood that run the length of each plank, often called 'absorption strips,' that are intended to reduce cupping. Solid wood floors are mostly manufactured .75 inches (19 mm) thick with a tongue-and-groove for installation.